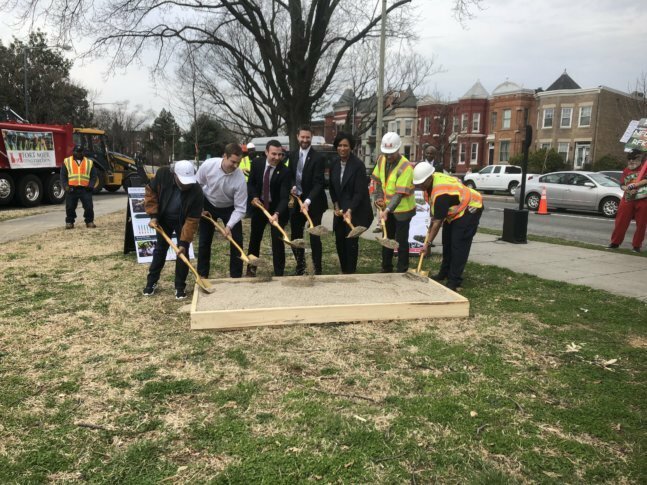 After years of waiting, major safety improvements are on the way for a commuter corridor that runs through a Northeast D.C. neighborhood. “Maryland Avenue, as you can see it right now, was a road that was built to handle about 30 to 45 minutes in the morning, but we live with it 24 hours a day,” said Ward 6 Councilman Charles Allen. Construction is expected to begin this spring to narrow the four-lane road that drivers frequently speed down between the Supreme Court on Capitol Hill and 14th Street Northeast, near the “Starburst” intersection of H Street Northeast, Florida Avenue Northeast and Maryland Avenue Northeast. Today, the road carries about 11,000 vehicles a day. Details about construction-related lane closures or other changes are expected within the next month or two. When the project is completed about two years from now, Maryland Avenue will generally have one lane for cars traveling in each direction, bike lanes on each side of the road and curbside parking. “The redesign is going to leave us with a safer street. It’s going to be a safer street for everybody,” Allen said at a ceremonial groundbreaking Monday. “It’s going to be a better ride for cyclists, I think it’s going to be a better ride for drivers as well. District Department of Transportation Director Jeff Marootian was equally optimistic. “We are going to be making it safer for everybody. We’ll be adding new bike lanes, new traffic signals, new trees. “We’ll be narrowing the travel lanes from four to two, and we’ll be improving the pedestrian experience … shortening the distance that it takes to cross Maryland Avenue,” Marootian said. People who live along Maryland Avenue have been pushing for changes following crashes and other concerns. They want it to be safer for people to go to schools, parks and libraries. Allen has heard complaints from residents for at least eight years — 10 years by the time the project is done. “We have a neighborhood that gets divided by a road that we have travelers — and largely commuters — that cut through way too fast that put people at risk whether you’re trying to cross the street, get to the library, go to the park or you’re on your way to school,” Allen said. Marootian hopes other key projects can move more quickly in the future, including some projects proposed in Mayor Muriel Bowser’s budget. This includes bus lanes along K Street Northwest to Georgetown and the rebuilding of the dangerous intersection at New York Avenue and Florida Avenue Northeast — known as “Dave Thomas Circle” — to remove the Wendy’s in the middle of the intersection.